The first Julie Klassen novel I read was The Dancing Master, reviewed here. 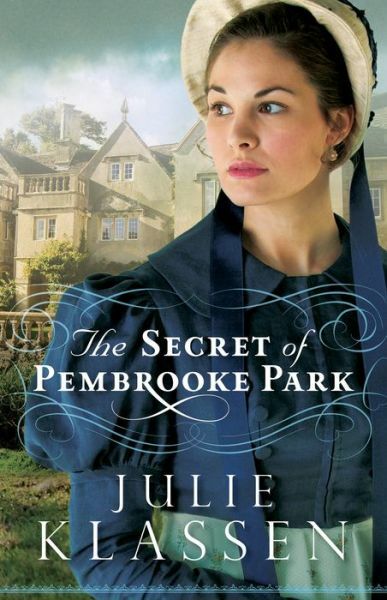 I liked it well enough to want to read more Klassen, and The Secret of Pembrooke Park was a great follow-up. THE PLOT: When the Foster family loses almost all their money, Mr. Foster blames his oldest daughter, Abigail. Abigail had recommended that her father invest in her uncle’s banking firm, which has failed. To make up for it, Abigail has her family use her dowry to fund a season for her younger sister, Louisa…even though Louisa seems to have stolen the affections of Abigail’s childhood friend and crush, Gilbert. In the meantime, the Fosters are offered a temporary home at abandoned Pembrooke Park on the condition that they fix the place up. While Louisa and her mother stay in London, Abigail and her father travel to Pembrooke. Abigail finds that intrigue abounds at Pembrooke. Why was it so hastily abandoned? What happened to the former owners? Who is leasing it to the Fosters? Is there really a secret treasure room? Who is sending Abigail anonymous diary passages? What does the local parson William Chapman and his family know about the secrets? Why does William’s sister choose to be almost a recluse? And does Abigail really want Gilbert back once he grows disenchanted with her sister, or has she developed real love for William? MY TWO CENTS: First, let me say that this author gets the very best covers. Love the appropriate clothes, and the colors are striking. LOVE IT. Second, even though Julie Klassen is a Christian writer, I feel like the reader isn’t overwhelmed with Christian messages; there is an appropriate amount of religion for the time period. While there is more religion in this book than there was in The Dancing Master, that’s kind of a given since William is a parson. Non-Christians who are looking for a clean regency mystery/romance will still enjoy it. Klassen books might even appeal to a broader audience than traditional romances do. I think a lot of people still enjoy a simple romance that doesn’t border on erotica, and this fits the bill. Finally, there is definitely a gothic element to this book, between the midnight creakings that disturb Abigail, the mysterious cloaked figure, and more than one fire. I would say this is more of a mystery than a romance, as evidenced by the book’s title. BOTTOM LINE: A bit of gothic mystery, a bit of romance, and not too preachy for a Christian writer. If you’re a fan of Jane Austen, you’ll probably like this book regardless of your religious beliefs. ON SALE DATE: The book will be on sale in eformats on November 25, 2014, and in paperback on December 2, 2014.